Uttarakhand has a total area of 53,566 km², of which 93% is mountainous and 64% is covered by forest. Most of the northern part of the state is covered by high Himalayan peaks and glaciers, while the lower foothills were densely forested till logged by British log merchants and, after independence, by forest contractors. Recent efforts in reforestation, however, have begun to restore the historical environment. The Himalayan ecosystem provides habitat for many animals (including bharal, snow leopards, leopards and tigers), plants, and rare herbs. Two of India's largest rivers, the Ganges and the Yamuna, originate in the glaciers of Uttarakhand, where they are fed by myriad lakes, glacial melts and streams. 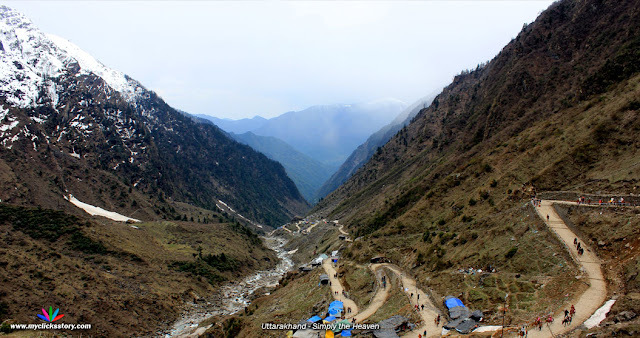 Uttarakhand lies on the southern slope of the Himalaya range, and the climate and vegetation vary greatly with elevation, from glaciers at the highest elevations to subtropical forests at the lower elevations. The highest elevations are covered by ice and bare rock. Below them, between 3,000 and 5,000 metres (9,800 and 16,000 ft) are the western Himalayan alpine shrub and meadows. The temperate western Himalayan subalpine conifer forests grow just below the tree line. At 3,000 to 2,600 metres (9,800 to 8,500 ft) elevation they transition to the temperate western Himalayan broadleaf forests, which lie in a belt from 2,600 to 1,500 metres (8,500 to 4,900 ft) elevation. Below 1,500 metres (4,900 ft) elevation lie the Himalayan subtropical pine forests. The Upper Gangetic Plains moist deciduous forests and the drier Terai-Duar savanna and grasslands cover the lowlands along the Uttar Pradesh border in a belt locally known as Bhabhar. These lowland forests have mostly been cleared for agriculture, but a few pockets remain.